European Commission President Jean-Claude Juncker said: "60 years ago, Europe's founding fathers chose to unite the continent with the force of the law rather than with armed forces. We can be proud of what we have achieved since then. Our darkest day in 2017 will still be far brighter than any spent by our forefathers on the battlefield. As we mark the 60th anniversary of the Treaties of Rome, it is time for a united Europe of 27 to shape a vision for its future. It's time for leadership, unity and common resolve. The Commission's White Paper presents a series of different paths this united EU at 27 could choose to follow. It is the start of the process, not the end, and I hope that now an honest and wide-ranging debate will take place. The form will then follow the function. We have Europe's future in our own hands." The White Paper looks at how Europe will change in the next decade, from the impact of new technologies on society and jobs, to doubts about globalisation, security concerns and the rise of populism. It spells out the choice we face: being swept along by those trends, or embracing them and seizing the new opportunities they bring. Europe's population and economic weight is falling as other parts of the world grow. By 2060, none of our Member States will account for even 1% of the world's population – a compelling reason for sticking together to achieve more. A positive global force, Europe's prosperity will continue to depend on its openness and strong links with its partners. The White Paper is the European's Commission contribution to the Rome Summit, the moment when the EU will discuss its achievements of the past 60 years but also its future at 27. 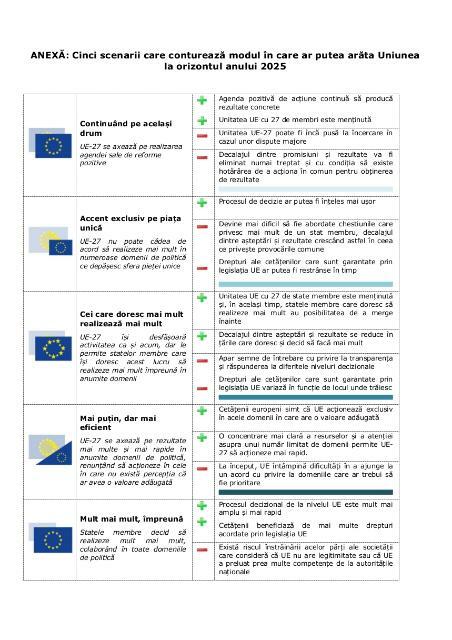 The White Paper marks the beginning of a process for the EU27 to decide on the future of their Union. To encourage this debate, the European Commission, together with the European Parliament and interested Member States, will host a series of 'Future of Europe Debates' across Europe's cities and regions. 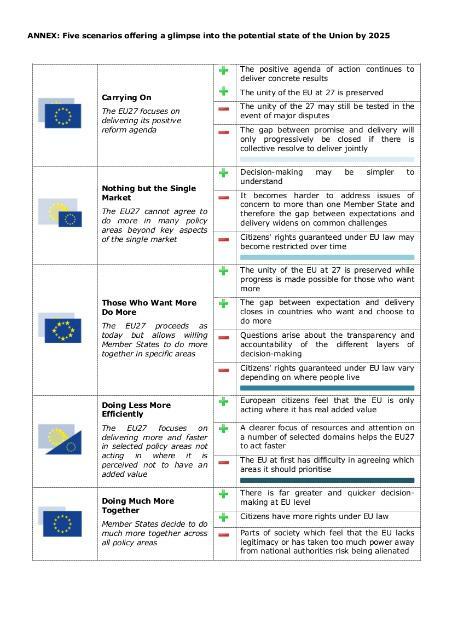 Like the White Paper, the reflection papers will offer different ideas, proposals, options or scenarios for Europe in 2025 without presenting definitive decisions at this stage. Sixty years ago, inspired by a dream of a peaceful, common future, the EU's founding members embarked on an ambitious journey of European integration, with the signing of the Treaties of Rome. They agreed to settle their conflicts around a table rather than in battlefields. As a result, the painful experience of Europe's troubled past has given way to a peace spanning seven decades and to a Union of 500 million citizens living in freedom and opportunity in one of the world's most prosperous economies. The 60th anniversary of the Treaties of Rome on 25 March 2017 will be an important occasion for EU27 leaders to reflect on the state of play of our European project, to consider its achievements and strengths as well as areas for further improvement, and to show common resolve to shape a stronger future together at 27. As announced by President Juncker in his State of the Union speech of 14 September 2016, which was welcomed by the EU-27 leaders at the Bratislava Summit of 16 September 2016, the Commission has today presented a White Paper on the future of Europe in order to launch the debate ahead of the Rome Summit.